In 1984, John Hanks (background machinist, inventor, BBA Economics) went to work for a nationwide manufacturer of fire hydrant parts. Traveling from coast to coast, he became amazed at the enormous numbers of fire hydrants that had failed and been removed from service, with the resulting waste. Nearly every city had them, some big customers throwing away 50 every week (with up to 250 hydrants in a scrap pile), and almost every smaller city with at least one or two. With the replacement cost (when all factors are considered) approaching $4,000 per hydrant, the magnitude of the waste becomes apparent. Many customers told him "We don't repair fire hydrants, we always dig them up and buy a new one". Quality Hydrant Company was formed in 1988 to address the above problems. The enitre main valve assembly (new) only costs between $900 and $1,200, With the aforementioned $4,000 replacement cost, the potential savings to a customer are enormous. Disassembly. The main reason that the seat ring is difficult to remove is the electrolysis and galvanic action between the seat ring and hydrant elbow. The "rust" (actually a new material that forms in the corrosion area) grows and locks in the seat ring. The hydrant needs to ordered with a brass subseat, or rebuilt with a brass subseat (see Long Life Hydrants). We have develped several methods for removing stuck seat rings, and a section in our Fire Hydrant Repair School will give customer's effective training in this important topic. Adequate Tools-Most seat wrenches are the lightweight T-Wrench. The intent is to twist a small 1 1/4" stem in order to disengage a 6" thread that has been buried underground 4 to 6 feet, for 20 years or more. Chances are 9 out of 10 that this will not work. This can result in broken parts in the main valve assembly that were good before the repair was attempted. We have developed an effective seat wrench that engages the seat ring, not the stem. 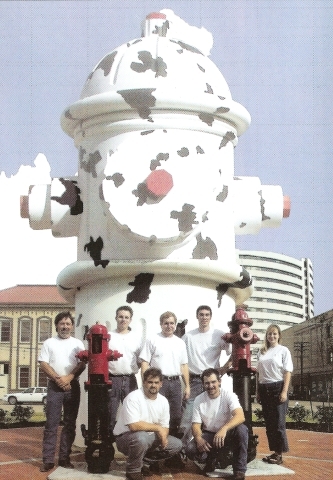 Still Leaks-We began rebuilding fire hydrants in 1988. Most problems with "still leaks" are due to (a) inadequate compression of the seat O-Ring or (b) pits in the seat O-Ring compression area. Hard to Operate-The same electrolysis and galvanic action as in 1. are at work here. Quality Hydrant Company has developed an inexpensive line of stainless steel stems and Fire Hydrant Parts to combat this problem. Old Guys Have Retired-Our Fire Hydrant Repair School teaches all the methods we have learned over the past 25 years. Thank you for visiting our website. Please call us!